Are you curious how the telephone pole lines in your neighborhood are similar to neurons in your own body? 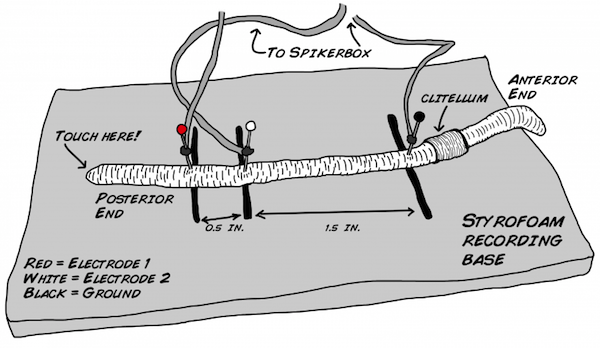 Find out in this lesson plan and learn about electrical cable theory while measuring the different speeds of the earthworm's nerve fiber system. You will learn how the earthworm's Lateral and Medial Giant Nerve Fibers transmit sensory information, and you will learn about Cable Theory and how neuroscientists have been applying it to explain the physical properties of axons. 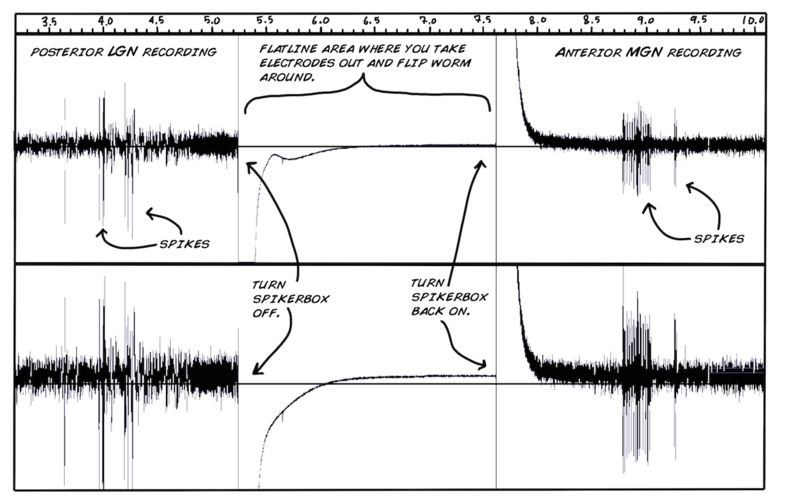 Introduction to Conduction Velocity - We recommend completing this experiment first, as it will teach you how to set up earthworm experiments and use your Neuron SpikerBox Pro. Faraday Cage - Noise can sometimes be a problem when recording, and a Faraday Cage helps you eliminate it. You may need to use one for this experiment. Note: This experiment was peer-reviewed and published by the American Physiological Society in the journal "Advances in Physiology Education" - Read the paper, intrepid scientists, for a more in-depth treatment of the experiment described below. 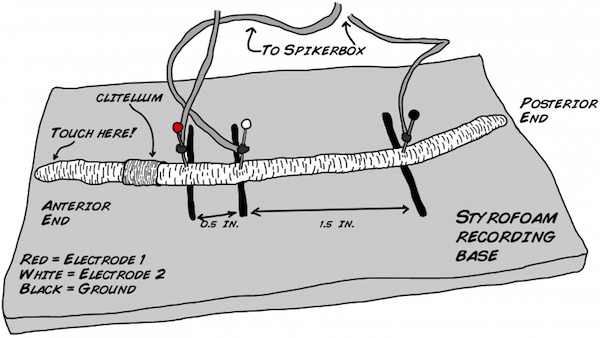 Previously, you learned how to measure conduction velocity from the earthworm's nerve fiber system. You remember that the worm has three large neurons that run the length of its body, the medial giant nerve (MGN) and the two fused lateral giant nerve (LGN). 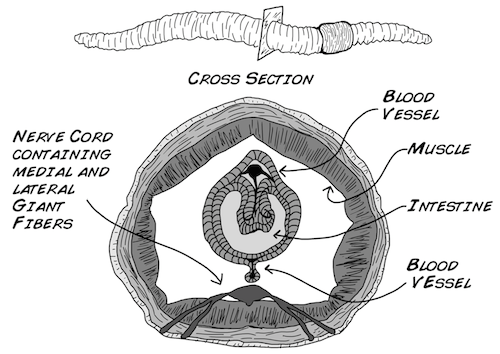 Let's take a closer look at the ventral, or "bottom," nerve cord containing these medial and lateral giant nerves. One of the differences between invertebrates (insects, worms, and so on) and vertebrates (dogs, lizards, us) is that invertebrates have a ventral nerve cord (running along their "belly") whereas we have a dorsal nerve cord (our spinal cord runs along our backside). Both the MGN and LGN play an important role in ensuring the worm's senses communicate with its muscles (Drewes et al. 1978). The MGN transmits sensory information about the anterior or front of the worm (the end closest to the clitellum). In contrast, the LGN transmits sensory information about the posterior, or back of the worm (the end farthest from the clitellum). There is a physical size difference between these two systems as well. 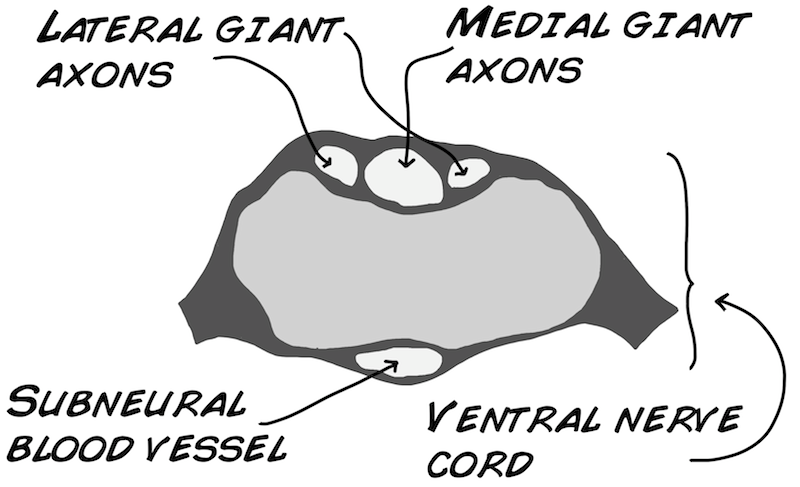 The medial giant nerve, at 0.07 mm in diameter, is slightly wider than the lateral giant nerve (0.05 mm in diameter) (Kladt et. al 2010). When thinking about how an action potential travels down a neuron's axon, it is useful to think about an analogy of a television's volume. Think about turning on your TV and then slowly walking away from it. As you walk further and further away what happens? 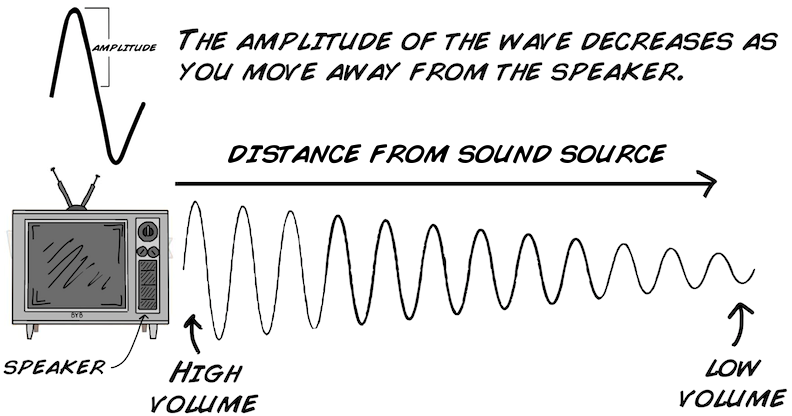 The sound coming from the speaker gets quieter and quieter the further you are away from the source. This example is analogous to a voltage change (basis of an action potential) flowing down a neuron's axon. In a hypothetical neuron with the active ion channels removed, let's change the voltage in the cell body and take three measurements along the axon. What do you think the measurements will look like? Notice that the signal decays. The strength of this decay is determined by two things, the time constant and length constant. Time for some math and electronics, our favorite subjects (besides neurons of course). What do the r's and c's mean? r is "Resistance" to current flow, and c is "Capacitance," a measure of the storage of charge across an insulating barrier. First, let's talk about the length constant (this is sometimes also called the "space constant"). The length constant (λ, or lambda) is a measure of how far the voltage travels down the axon before it decays to zero. If you have a length constant of 1 mm, that means at 1 mm away from the cell body in an axon, 37% of the voltage magnitude remains. At 2 mm away from the cell body in an axon, 14% of the magnitude remains, and at 3 mm away, 5% remains. This is representative of an "exponential decay" function. The length constant is calculated from rm and ri. 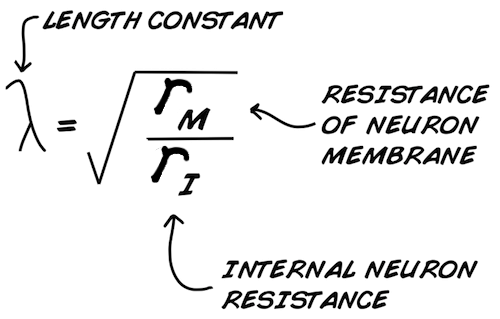 rm is the electrical resistance of the neuron's membrane, or how "electrically leaky" it is. The larger rm ("less leaky") is, the larger the length constant will be. ri is the resistance of the intracellular fluid (called axoplasm) inside the axon. Conversely, the lower ri is, the larger the length constant will be. The time constant (Τ, or tau) is similar to the length constant, but applies to time. If a voltage change is applied inside a neuron, it takes time for the neuron to fully "charge" to a stable voltage. 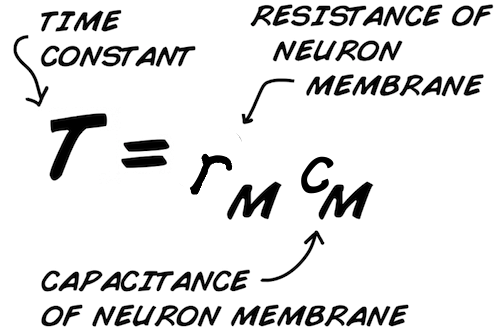 In the time constant equation, cm is the capacitance of the neural membrane, which is a measure of the membrane's ability to store charge. The higher the capacitance, the more time it takes for the capacitor to fully charge (or discharge), acting as a "buffer" to any sudden voltage change. Thus, the smaller both rm and cm become, the smaller the time constant is and the less amount of time is needed to change an axon's voltage. An "ideal neuron" would have an infinitely high length constant and an infinitely low time constant. Thus, any voltage change anywhere in the neuron would instantly change the voltage everywhere else in the neuron. Both the time constant and length constant are "passive" properties of the neurons. So, how do your neurons stop electrical signals from decaying to zero? By becoming "active" and using Ion Channels! Your neurons use sodium and potassium channels to regenerate the action potential flowing down the axon to "fight the decay" that occurs due to the length and time constants. As an action potential fires down your axon, sodium and potassium channels continually open and close to recharge the action potential and "propagate it" down the axon. As you know from the previous earthworm experiment, this action potential propagation down a neuron has a finite speed. Each time an ion channel needs to open to recharge the action potential, this delays the propagation of the action potential by ~1 ms. And the smaller your length constant is, the more you have to regenerate the action potential by having ion channels open along the length of the axon. How can we increase the length constant? We can do this by increasing rm. Is there a way we can do this? Myelin is a fatty covering produced by special cells called Schwann Cells and Oligodendrocytes. This covering is what makes the axons look similar to hot dog rolls, and why the brain is sometimes called a "lump of fat." This fatty covering makes the neural membrane less leaky and increases rm substantially. But what do you think would happen if you covered the whole axon in myelin? Unfortunately, the length constant is not increased enough for you to get away with this. The action potential still needs to be regenerated along the axon, though not as many times as an unmyelinated axon. This is why the myelin sheath is discontinuous, with periodic exposed bits of neural membrane called "Nodes of Ranvier." In these nodes no myelin covers the membrane, and plenty of active ion channels reside there. The discrete regeneration of action potentials between lengths of myelin at the Nodes of Ranvier is called "saltatory conduction." Related Fact: Saltar is Spanish for "to jump." A grasshopper that lives in the Andes Mountains, for instance, is called "Saltamontes" or "mountain jumper." But wait! Covering the neurons with myelin makes the inside and outside of the neural membrane farther apart from each other. As capacitance is affected by the distance of separation between the charged bodies (see your Haliday and Resnick), myelin will decrease cm. Does this cause a decrease in time constant as well then? Well, perhaps not, since, as we said earlier, the myelin also substantially increases rm. The result of this simultaneous reduction in cm and increase in rm is hypothesized to cause no net change in the time constant, although direct experimental evidence in the literature is lacking. If you have two equal diameter axons and one has a myelin sheath of 1 mm thickness, and the other has a myelin sheath of 2 mm thickness, how much faster will the second axon be? Unfortunately, again, this answer appears to be experimentally unknown, as neurons with increased myelin thickness also simultaneously have increased axon diameter. What has been generally borne out with computer simulations is that a myelinated neuron twice as thick as another myelinated neuron will have a conduction velocity twice as fast. while the internal resistance changes with area of the axon. Thus, the length constant, and conduction velocity, scales with the square root of the radius. Note that the benefits of myelin substantially outweigh the benefits of axon diameter size. Tripling the myelin thickness increases the conduction velocity 3x, whereas tripling the axon diameter only increases the conduction velocity by the square root of 3, or 1.7 times. There is a metabolic cost, however, to making myelin (you need to keep the special cells alive that coat the neurons in fat), so it's not the perfect solution for all animals. But...even the largest axons without myelin in the animal kingdom, such as the 1 mm diameter squid giant axon, only has a conduction velocity of 20-25 m/s second! You have myelinated axons in your body (the A alpha fibers) that are only 13-20 μm in diameter (1/100 of the size of the squid axon), yet have conduction velocities that are 80-120 m/s! Myelin is a wonderful biological invention, allowing neurons to get both small and fast, but it is expensive. Sound confusing? Don't worry, it was confusing for us too during our education. Welcome to "Cable Theory", which was originally developed in the 1800's when engineers were trying to understand signal transmission across long distance telegraph lines. Neuroscientists then applied this theory to neurons in the early 20th century. But what does all this cable theory mean with regard to the two nerve types in the earthworm? Since the MGN is 1.4 times greater in size than the LGN, we should expect it to be 1.18 times faster. We previously measured the LGN to be ~10-14 m/s, so thus we would expect the MGN to be 12 - 17 m/s. That's a small difference for our equipment to detect, but let's try the experiment to see if our results match the theory! Note: The video below is a more recent July 2015 video on our worm stretch experiment, but serves as a tutorial to use our new software, and the procedure is very similar. You can view the original December 2012 video here. Anesthetize and take a recording of the posterior end of the worm as you did in the previous experiment. Once you get several spikes, rotate the worm 180 degrees and reposition the electrodes. You will be measuring from the anterior end of the worm this time. Now record several spikes from the anterior end by touching the head of the worm with a wooden probe. Once you have several spikes, you can stop recording and return the worm to its soil. The earthworm is quite resilient and recovers well from this experiment. Now you are ready to look at your data. You should see a flat line or excessive noise when you flipped the electrodes around. This serves as your time marker of when you flipped the worm, and now you know which spikes belong to the posterior end and which spikes belongs to the anterior end. The figure below shows a recording of electrode 1 on the bottom and electrode 2 on the top. You can now zoom in on your spikes and measure the conduction velocity. Take readings of 5-6 spikes. Repeat the experiment several times with some worms. This will give you a good data set to work with. Don't forget to clean your electrodes with some alcohol or water and a paper towel after each worm. You now need to run a statistical test, namely the T-test, to examine whether the conduction velocities are different for the two nerves. If you do not yet know how to do this you can take your data set and follow along in our statistics lesson plan. If you have done this lesson plan or have some experience in statistics then you can go ahead and perform the calculations below. Take the average and standard deviation of your MGN and LGN recordings. Finally, let's calculate our t-statistic and p-value. What did you find? Are the two conduction velocities different from each other? If your experiment was successful, you should have found that the MGN (anterior end) conduction velocity was indeed significantly faster, but not 1.2x faster, but more like 2-4x faster! Why is this? You may recall that the earthworm neurons are actually myelinated! Some invertebrates, such as some shrimp and some worms, actually do have myelin. 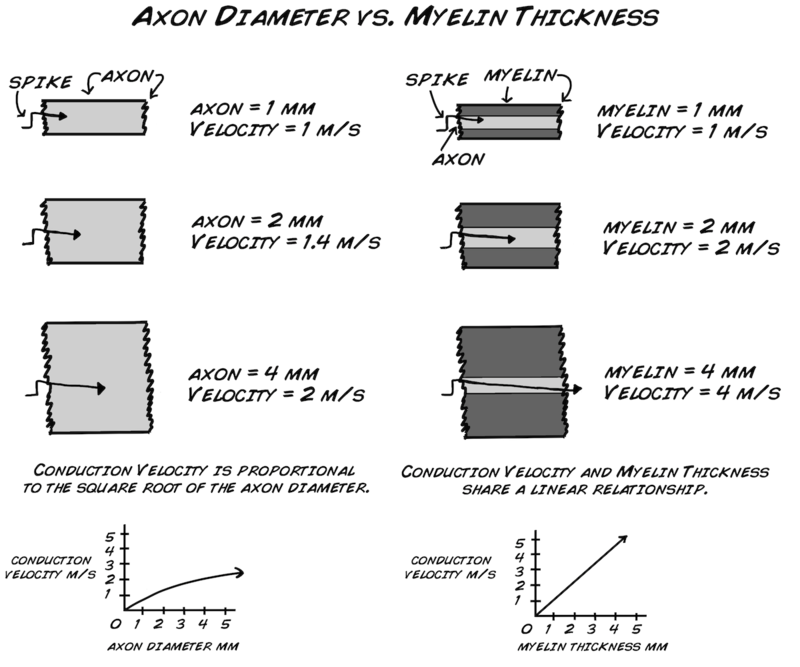 Typically, as axon increases its diameter, its myelin thickness also increases. Perhaps the MGN has a thicker myelin sheath as well. This would make for an excellent histology project to find out. Let us know if you are up to the challenge, and let us know what you find! If you have an idea about what causes this unexpectedly large difference, we would love to hear about it. Maybe your professor knows? Welcome to biology and unexpected findings! Also, if you understand why having a longer time constant increases conduction velocity, let us know that as well. Does the anesthetic have an effect on the conduction velocities of the MGN and LGN? Does a worm's general size have an effect on conduction velocity? You can also anesthetize the worm in a 40% - 60% carbonated water solution for 5-9 minutes as an alternative anesthetic. Will this change the conduction velocity measurements. The worm Lumbriculus variegatus (California Blackworm) actually has a larger LGN than MGN, so we would expect our results to be the opposite of what we observed here with our Lumbricus terrestris nightcrawlers. Do this experiment and let us know what you find! How thick is the myelin? We don't have access to extensive histology resources, but you may. Why not take some slices of the earthworm, measure the axon diameter and myelin thickness on both nerves, and report back to us? This can sometimes be a difficult experiment, because the worm may not produce spikes depending on the amount and time of anesthetic used as well as the general health of the worm. If you stick to the 10% alcohol solution for about 3-6 minutes, the worm should produce spikes most of the time as soon as you start (don't forget to wash the worm in water after you anesthetize it). You may also want to try touching the worm with more or less pressure. Sometimes a very small tap will work, other times a stronger press might be needed. Some worms respond better to a stimulus at the very end of their bodies, while other respond better to a stimulus a few centimeters inwards. Finally, sometimes you will cause an artifact when you touch the worm. Looking closely on the artifact waveforms, the artifacts will appear at exactly the same on both channels. This is a fake spike and not physiological! Sometimes, drying your probe periodically helps; also do not rehydrate the worm in water too much (though also be careful not to dry the worm out). It is a careful balance, and you will develop your own style and technique as you gain experience. You can also use an air stimulus from an air can in lieu of a plastic, wooden, or glass tip if you are getting too many fake spikes. You may also want to flip the worm over so the ventral or bottom side is facing up. Doing this means when you touch the worm with your probe the touch will be closer to the nerve.